Smallpox virus, colorized and magnified in this micrograph 42,000 times, is the real concern for biologists working on a cousin virus — horsepox. They're hoping to develop a better vaccine against smallpox, should that human scourge ever be used as a bioweapon. University of Alberta microbiologist David Evans (right) and his research associate Ryan Noyce, created the synthetic horsepox virus. "There was some confusion," Evans told NPR, "probably my fault although I'd thought we'd discussed it back around 2014." If he didn't talk about it with the company, Evans says, it's because his own inquiries had convinced him that the stored virus "wasn't suitable for our goals." Evans says the virus-making techniques his team has developed will advance the field of pox viruses and help turn them into new vaccines or therapies for diseases like cancer. "To say that somehow we shouldn't take advantage of the technology that's out there — and which is being used in all sorts of different ways in all areas of biology — and put off limits, somehow, one virus doesn't make a whole lot of sense to me," he says. "I mean, someone had to bite the bullet and do this," Evans adds. "But now that I've done it, my colleagues in this field can go forward and do their experiments. I'm a big boy. I'm used to the occasional bit of abuse rolled at me. And it doesn't particularly bother me that much." For more than a decade, policymakers and biologists have been debating how to oversee new advances that might be misused to create germs that could — by accident or on purpose — start a global outbreak. Despite lots of expert committees, new rules and heated debates, the horsepox experiment was done by a privately funded group that simply presented its lab-created virus to the world as a fait accompli. Does the world need a "safer" smallpox vaccine? While the company that funded the work says its synthetic horsepox has potential as a safer smallpox vaccine, some biosecurity experts question whether there is any need for one. Despite that, the government offers financial incentives that would allow a company to make huge profits from developing a new smallpox vaccine. "This is a little bit crazy. We have a very problematic, difficult decision to make about the reasonableness and appropriateness of this work, and it's being pushed forward by those that have obvious conflicts of interest in a for-profit motive," says Dr. David Relman, a microbiologist at Stanford University who tried, without success, to stop a scientific journal from publishing the details. Smallpox is an often deadly, contagious disease that holds a unique place in medical history. Back in the 18th century, biologist Edward Jenner invented vaccination by giving people a less-virulent, related pox virus to generate an immune response that protected them from smallpox. An unprecedented global vaccination campaign wiped out smallpox by 1980, making it the first disease ever eradicated. The virus that causes smallpox now is supposed to reside only in two locations: secure labs in the U.S. and in Russia. The U. S. government also stockpiles smallpox vaccine, in case the virus ever gets used as a weapon. The possibility of creating a new, safer vaccine is why a pharmaceutical company executive named Dr. Seth Lederman wanted to get his hands on horsepox. He says historical writings suggest that Jenner's vaccine against smallpox, which was derived from cowpox, actually originated in a pox disease that infected horses. Trouble was, Lederman had no way of getting horsepox, which is believed to be extinct in nature. At one time, the U.S. Department of Agriculture held a sample. But when Lederman asked, the agency said it no longer had the virus. Lederman knew Evans, an expert in pox viruses, and the two discussed the possibility of synthesizing horsepox from pieces of made-to-order DNA. Lederman and his company in New York, Tonix Pharmaceuticals, decided to give it a go and fund the effort. "It was so unlikely that it would work, that maybe we didn't spend as much time as you might think on the implications of it," says Lederman, "although we were certainly mindful of the implications of it, and we followed all the applicable regulations in Canada," where the work was done. The team ordered bits of DNA from a commercial firm for about $100,000. 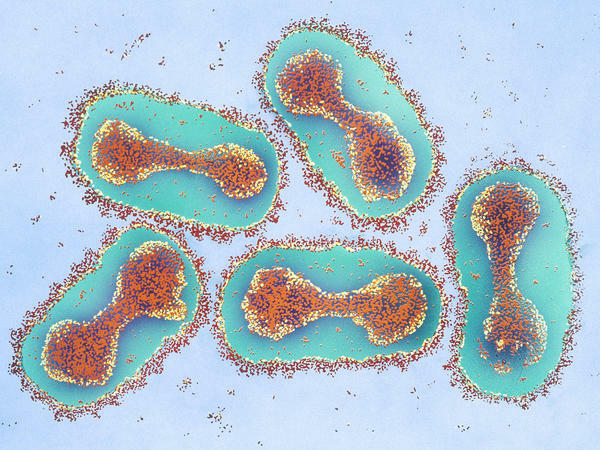 Evans and colleague Ryan Noyce figured out how to stitch the pieces together, using tricks like helper viruses, to generate infectious horsepox by the summer of 2016. Asked whether he would have been interested in synthesizing horsepox if he had known it was possible to obtain a sample of the natural virus, Lederman told NPR: "No. A primary rationale for the need for the synthesis is that a natural isolate of horsepox was not thought to be available for vaccine research." Unbeknownst to him, however, there was one available. In 2014, Evans had tracked down the old USDA sample, which had moved to the Centers for Disease Control and Prevention. He contacted the CDC and was told the process of getting the natural virus would start with something known as a material transfer agreement. "Dr. Evans indicated that he was working with a New York-based company and they would likely be the ones to request an MTA," says Dr. Inger Damon, director of the Division of High-Consequence Pathogens and Pathology at the CDC. But that didn't happen. "No further request was received," says Damon, who notes that the CDC often works with commercial companies that are developing new tests, treatments and vaccines. A natural virus might be harder to "commercialize"
Evans told NPR that the CDC would have supplied him with its horsepox virus for research, but he saw a potential problem. The virus sample was collected back in 1976 from sick Mongolian horses, and Evans worried that some forgotten restriction on sharing or using the virus might crop up later on and become a problem for Tonix's effort to sell horsepox as a new smallpox vaccine. "It's a major problem if one hopes to have any future commercial 'freedom to operate,' " says Evans. "That's why it would not be suitable for vaccine research if one hoped eventually to commercialize the virus." That wasn't the explanation he has given in the past for why he had to synthesize the virus. In a report last month describing the work, he and his colleagues stated that natural horsepox may be extinct and that the only known specimen was "unavailable for investigation." And he recently told a group of scientists that making the virus was the "solution" to the "problem" of not being able to get access to the one known strain of horsepox. "We were wondering if we could find out more about this virus, but the challenge is that there was one stock of it which was unobtainable," Evans said at a meeting in Singapore in 2017. "And so we thought, 'Well, could we have a stab at trying to make that?' "
After having dropped the conversation with the CDC about horsepox in 2014, Evans contacted the CDC again in March 2016 to once again request access to its stored virus. "He reached out to see if he could obtain the virus from CDC to compare with a virus he was working on," says Damon. "It is our understanding that his work to re-create the horsepox virus had begun." The company that funded that work didn't find out that the CDC's sample of natural virus existed until February 2017. That is when, Lederman says, it saw a reference to it in a scientific article that had been published a few months before. At that point, the horsepox synthesis was a done deal, and Lederman now sees its advantages. "While the CDC virus would be experimentally interesting (and we'd still like to get some), from what I understand now, concerns over its origins might create challenges from a product development perspective," Lederman told NPR in an email. If Tonix's horsepox virus gets approved by the Food and Drug Administration as a smallpox vaccine, the company could get a lucrative reward: a special voucher that the government gives to companies that have developed medical countermeasures against potential security threats. Such vouchers can be used to speed up the government's review of any new drug, and they are fully transferable to other pharmaceutical companies. That means they can be sold, potentially for hundreds of millions of dollars. "It's certainly something that investors understand," says Lederman, whose company highlighted this possibility in a press release about its horsepox work. Some biodefense experts are questioning whether it makes sense for the government to incentivize this kind of research, especially given the biosecurity concerns. "We believe that the creation of horsepox demonstrates the need for dialogue in the biodefense arena about the need for another smallpox vaccine," they recently wrote in the journal Health Security. Not even Evans seems sure that horsepox will end up being useful as a better smallpox vaccine. "I don't know. Depending on the day of the week, I could argue either side of the equation," says Evans. Since 2001, according to the World Health Organization, Evans served on a special committee that provides global oversight of research with the remaining, closely-held stocks of smallpox. Research on no other pathogen gets this kind of international scrutiny. A debate over whether the last stocks of smallpox should be destroyed has gone on for years. But advances in DNA technology seemed to be quickly making that question moot. After all, it was becoming increasingly feasible that someone could re-create a smallpox virus in the lab. In November 2016, in a last-minute addition to the agenda of the committee's annual meeting, Evans made an unscheduled presentation to reveal that he had made horsepox, a large pox virus like smallpox, from scratch. Synthetic biologist Drew Endy, of Stanford University, had just been brought onto the WHO's smallpox committee to help it consider the implications of new technologies for virus creation. He was stunned to hear this news at the first meeting he ever attended. "It was a unilateral act," says Endy. "And so I found it to be, from a personal perspective, shocking in a way." Some members of the WHO committee have devoted their entire professional lives to wiping smallpox from the face of the Earth, he notes, and suddenly Evans had forced them to confront the fact that reality had changed. At the meeting, Evans stated that his rationale for the work was to show that the re-creation of a pox virus was not just a theoretical possibility, according to Asheena Khalakdina, a technical officer at the WHO. She said that in 2017, when Evans declared his relationship with Tonix and his work on the development of a smallpox vaccine, the WHO rescinded his membership on the smallpox committee. "I don't get any personal financial gain from Tonix commercializing a smallpox vaccine," Evans told NPR, though he does work as a consultant for the company. "The work was done on contract, and they own the virus." In 2015, Evans served on another WHO working group to look at how emerging DNA technology would affect the ability to re-create smallpox. His conflict of interest disclosure for that noted that he was discussing a possible research contract with a company interested in synthesizing a pox virus. "They knew I was doing this," Evans says. With the horsepox virus re-created, and the WHO committee informed, the researchers pursued publication of the work in a scientific journal. That is routine practice for biologists, to ensure that others can reproduce and validate the science. But biologists have argued in recent years over whether it's wise to openly publish details of research that might be misused to produce a bioweapon. Evans says his university's lawyers reviewed his manuscript to make sure that publishing it wouldn't break any laws and consulted with Canada's foreign affairs and public health agencies. "Without publishing the work, there's really no way for us to communicate with investors and partners," says Lederman, at Tonix. What's more, a patent application would make it all public anyway. A couple of science journals didn't want the manuscript — and at least one of them noted that it would raise biosecurity concerns. But a journal called PLOS One took the paper and put it through a small review panel that is supposed to screen research that might pose risks to the public if it were published. The chair of that committee is Grant McFadden, an expert on poxviruses at Arizona State University. He also serves on the WHO's smallpox committee and says he knows Evans well. "Everyone in the pox virus community pretty much knows everyone else," says McFadden. He saw no problem with publishing because, in his view, the advance just built on virus-making technologies that were already described in the open scientific literature. He and the other half-dozen members of the journal's special review committee spent a couple of weeks discussing the paper by email and did not request any additional input from outside security experts. "We felt we had enough sufficient internal expertise to make a call," McFadden tells NPR. "At the end of the day, everyone who weighed in was convinced that the scientific value of the paper outweighed the concerns." After all, he says, labs like his are already using more traditional DNA technologies to generate modified pox viruses. Going the fully-synthetic, made-to-order route could more efficiently generate pox viruses with multiple genetic alterations in the future. And if the FDA ever had to consider a modified pox virus as a therapy, creating it from scratch could make the review process more straightforward. "There are going to be multiple scientific issues in the future where making a synthetic virus from scratch might be the best strategy to get at the question," says McFadden. But just because a journal editor has expertise in the science doesn't mean they understand how to assess a biosecurity threat, says Arturo Casadevall, a microbiologist at Johns Hopkins University who is editor-in-chief of a journal called mBio. "They cannot evaluate the degree to which that information may be misapplied by others," says Casadevall, who wants to see a national security board set up so that journal editors have somewhere to go for guidance. "Perhaps this paper," he says, "will lead to some additional soul-searching and some action." As word got out that the synthetic pox virus paper was about to be published, worried outsiders began to contact the journal, urging its editors to reconsider. "I did not see, until a few days before publication, letters that had been sent to the journal expressing great concern," says Ron Atlas, a microbiologist and emeritus professor at the University of Louisville who serves on the review committee that gave the OK to publish the work. "I don't think that those letters would have changed my opinion of the research, but there were several very strong letters that said, 'Do not publish this.' "
One of the letter writers was Tom Inglesby, director of the Center for Health Security of the Johns Hopkins Bloomberg School of Public Health. "Anything that lowers the bar for creating smallpox in the world," says Inglesby, "is a dangerous path." Another letter asked why some details couldn't be held back to at least allow time for a broader discussion. "I thought that that was a very reasonable question to be asking," says Relman, "prior to publication of the details of how one essentially remakes smallpox." McFadden disputes claims that publishing the manuscript would give some terrorist or rogue nation helpful tips. "If you talk to people in synthetic biology that are professional constructors of novel genomes," says McFadden, "they would tell you that the technical advance was fairly minor in this case." At least one synthetic biologist disagrees with that assessment. "I think it's incorrect to assert that it's a nothing-burger," says Endy, who adds that he honestly doesn't want to get specific and draw attention to the most new and potentially useful virus-making tricks. "There are things in this paper that I wouldn't know how to do and had never been done before." There was an uproar in biology recently when scientists announced they'd used bits of DNA to manufacture a pox virus. Critics said the work is dangerous. Research teams had essentially published a recipe that could help terrorists brew up deadly smallpox. So why synthesize a pox virus in the first place? NPR's Nell Greenfieldboyce has this report. NELL GREENFIELDBOYCE, BYLINE: Smallpox is special. It's the only human disease ever wiped off the face of the planet by a global vaccination campaign. The contagious, often deadly virus is now supposed to exist only in two secure labs. This is why some biosecurity experts were taken aback when scientists recently synthesized a pox virus, manufacturing it from made-to-order pieces of DNA. It was not smallpox. It was a related virus, horse pox - but still. Tom Inglesby is director of the Center for Health Security at Johns Hopkins University's Bloomberg School of Public Health. TOM INGLESBY: Anything that lowers the bar for creating smallpox in the world is a dangerous path. GREENFIELDBOYCE: Exactly how much this lowers the bar depends on who you ask. This isn't the first virus ever made from scratch. And some say the pox virus-making methods published last month are no huge technical advance. But Drew Endy disagrees. DREW ENDY: I think it's incorrect to assert that it's a nothing burger. GREENFIELDBOYCE: He's an expert on synthetic biology at Stanford University who serves on a World Health Organization committee that oversees research on smallpox. ENDY: There are things in this paper that I wouldn't know how to do and had never been done before. GREENFIELDBOYCE: So why do it? DAVID EVANS: Why on earth did you want to try and make a horse pox virus? GREENFIELDBOYCE: That's the guy whose lab made it, David Evans at the University of Alberta, speaking at a recent conference. He said horse pox is extinct in nature. But some evidence suggested the virus might be useful as a safer smallpox vaccine. And the government still stockpiles vaccine in case of a bioterror attack. EVANS: So we were wondering if we could find out more about this virus. But the challenge is that there was one stock of it, which was unobtainable. GREENFIELDBOYCE: One specimen that was unobtainable, unavailable for investigation. EVANS: And so we thought, well, could we have a stab at trying to make that? GREENFIELDBOYCE: But why was the one specimen of natural horse pox virus off limits? It's held by the Centers for Disease Control and Prevention. Evans told me he contacted the CDC. But he said once it became clear that he was working with a company, and there was a commercial interest in the virus, there were problems. EVANS: I didn't want to sort of push my connections and try and get the virus if it was going to cause some difficulty. So we realized that it was probably not accessible that way. GREENFIELDBOYCE: When I called the CDC, however, that agency said it often works with companies that are developing new tests, treatments and vaccines. It says back in 2014, they told Evans what paperwork he'd need to do to get the virus. Evans replied that he was working with a company that would probably be the ones to follow up. But no one followed up. The CDC says they heard nothing back. So I asked Evans, why did you not pursue this? He said the CDC would've given him the virus, but he had concerns about its uncertain past. It was collected from a sick Mongolian horse in the 1970s. He says that meant some long-forgotten restriction on sharing might pop up later and foil efforts to commercialize the virus as a vaccine. Evans says he thought he discussed this with a company that paid him to synthesize the virus. But its CEO told me no. In fact, back then, the company had no idea the CDC sample existed. And if they'd known it was potentially available, that would've been preferable to setting out on a virus-making project. So the natural virus was available. The company would have been interested. But nonetheless, the virus got made from scratch. And Evans says it will truly revolutionize his field. EVANS: You know, someone had to bite the bullet and do this. But now that I've done it, my colleagues in this field can go forward and do their experiments, right? GREENFIELDBOYCE: He says labs like his could design made-to-order pox viruses to fight diseases like cancer. But others say, wait. It's not just scientists who are affected by this. Anything that would make it easier for someone with bad intentions to make smallpox could potentially impact all the people of the world. David Relman is a microbiologist at Stanford University. DAVID RELMAN: We shouldn't be leaving individuals to make these decisions on their own, which is essentially what we did here. GREENFIELDBOYCE: He says researchers have known for years that someone could theoretically make a pox virus from scratch. He thinks there should've been a much broader public debate before someone actually did it.